Osteoarchaeological studies provide valuable information concerning living conditions and life course changes in past societies. However, many skeletal markers, such as entheseal changes, are multifactorial in aetiology; thus, their interpretation is not straightforward. Generalised linear models (GLMs) are ideal for analysing such phenomena, i.e. those with multiple underlying causative factors, but, to date, their use has been limited. This paper focuses attention on using these models to test hypotheses regarding the aetiology of entheseal changes, widely regarded as indicative of activity patterns, but which are also affected by ageing and body size. 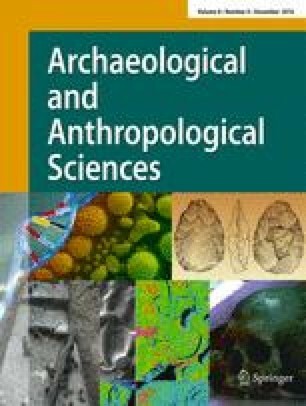 To demonstrate the use and limitations of these models, this paper provides an independent test of a previously developed GLM on an identified skeletal sample comprised of skeletons from four British sites (n = 58) which has a typical sample size for archaeological osteological analysis. In addition to this model, GLMs were developed to include the factor of body size and expand the models to test individual entheses, as well as joint complexes whereby multiple entheses for muscles which act synergistically have been pooled. The results indicate that the original model did not compare well with the frequencies of entheseal changes found in the British assemblage under study. The new models found no clear pattern of influence, although both ageing and body size were important for some entheses. GLMs are appropriate for testing the interaction of biological variables, but future studies need to take into account and test their applicability to archaeological sample sizes. The authors would like to thank the reviewers for their helpful comments. The first author would like to thank the Museum of London and St. Bride’s Church Fleet Street for access to the skeletal collections in London, with particular thanks to Jelena Bekvalac and Dr Rebecca Redfern. The first author would also like to extend their thanks to Malin Holst of York Osteoarchaeology Ltd, John Buglass of John Buglass Archaeological Services, Washburn Heritage Centre and Fewston and Blubberhouses Parochial Church Council who have granted access to the skeletons. The Fenwick Human Osteology Laboratory, Department of Archaeology, Durham University, provided workspace and access to this collection. CH’s contribution to this research was funded by Portuguese national funds through Fundação para a Ciência e a Tecnologia (FCT), the Foundation for Science and Technology postdoctoral grant SFRH/BPD/82559/2011 and their funding for the research centre of CIAS—Research Centre for Anthropology and Health (FCT/PEst-OE/SADG/UI0283/2013). FCT is supported by Programa Operacional Potencial Humano/Quadro de Referência Estratégico Nacional (POHP/QREN) co-funded by the Portuguese Government and the European Social Fund of the European Union.